I am interested in integrated geoengineering researches using geophysical and geotechnical technology fora sustainable development of energy and infrastructure, i.e., exploration of petroleum, mineral resources and groundwater; My current interests are with petrophysics, exploration geophysics, groundwater and HC flow modeling in porous and fractured media, application of near-surface geophysical tools in geotechnical engineering, land subsidence and soft clay in the large Asian deltas, artificial recharge of groundwater. Chung S. G., P. H. Giao, G. J. Kim and S. Leroueil (2002), Geotechnical Characteristics of the Pusan Clays, Canadian Geotechnical Journal, 39 (1050-1060) . Giao P. H., J. H. Kim and S. G. Chung (2002), Application of Engineering Geophysics in Investigation of Pusan Clays with reference to Reclamation Projects, The European Journal of Environmental & Engineering Geophysics,7 (3): 201-218. Chung S. G., J. M. Kwag, P. H. Giao, S. H. Baek and K. N. Prasad (2004), A Study on Soil Disturbance of Pusan Clays with reference to Drilling, Sampling and Extruding, Geotechnique, 54(1), 61-65. Giao P. H., N. T. Dung and P. V. Long (2008) An Integrated Geotechnical-Geophysical Investigation of Soft Clay at a Coastal Site in the Mekong Delta for Oil and Gas Infrastructure Development, Canadian Geotechnical Journal, 11, vol. 45, p. 1525-1537. 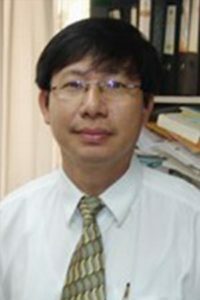 Phien-wej N., P.H.Giao and P. Nutalaya (2006), Bangkok Land Subsidence,Engineering Geology, 82 (4), p. 187-201, Elsevier. Giao P. H., A. Weller and D. H. Hien (2008), An Approach to Construct the Weathering Profile in a Hilly Granitic Terrain Based on Electrical Imaging, Journal of Applied Geophysics, 65 (2008) 30–38, Elsevier. The Romanian and Australian Governments’ scholarships for studies at Bucharest University (1977-1982) and AIT (1990-1992), respectively. Outstanding Academic Performance Merit Certificate for Vietnamese students studying abroad conferred by the Minister of Education ( No.117/QD, 1982). The Korean Governments Grant for the Visiting Professor (Scholar) position in the Brain Korea 21 Project (12/1999- 8/2001), Dong-A University. The Tan Swan Beng Award (2005) by the SE Asian Geotechnical Society (co-winner). Member, Asian Technical Committee ATC12 (Land Reclamation and Coastal Structure) from 2002, International Society of Soil Mechanics and Geotechnical Engineering (ISSMGE).